n Greek mythology, the Gorgon (plural: Gorgons) (Greek: Γοργών or Γοργώ Gorgon/Gorgo) was a terrifying female creature. It derives from the Greek word gorgós, which means "dreadful." While descriptions of Gorgons vary across Greek literature, the term commonly refers to any of three sisters who had hair of living, venomous snakes, and a horrifying gaze that turned those who beheld it to stone. Traditionally, while two of the Gorgons were immortal, Stheno and Euryale, their sister Medusa was not, and was slain by the mythical hero Perseus. Gorgons were a popular image of Greek mythology, appearing in the earliest of written records of Ancient Greek religious beliefs such as those of Homer. Gorgons sometimes are depicted as having wings of gold, brazen claws, the tusks of boars, but most often with the fangs and skin of a serpent. The oldest oracles were said to be protected by serpents and a Gorgon image often was associated with those temples. Lionesses or sphinxes frequently are associated with the Gorgon as well. 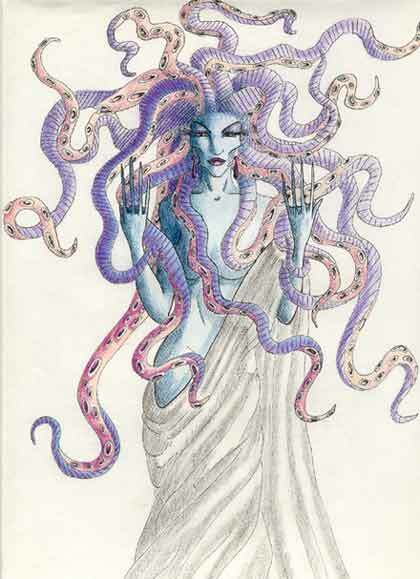 The powerful image of the Gorgon was adopted for the classical images and myths of Zeus and Athena, perhaps being worn in continuation of a more ancient imagery. The Gorgons were said to be the daughters of the sea god Phorcys and sister Ceto the sea monster. The date of Homer was controversial in antiquity, and is no less so today. Herodotus said that Homer lived 400 years before his own day, which would place Homer about 850 BC; but other ancient sources gave dates much closer to the Trojan War. Those who believe that the stories of the Trojan War derive from a specific historical conflict usually date it to the twelfth or eleventh centuries BC, often preferring the dates given by Eratosthenes, 1194–1184 BC, which roughly corresponds with archaeological evidence of a catastrophic burning of Troy VIIa. For modern scholarship, 'the date of Homer' refers to the date of the poems as much as to the lifetime of an individual. The scholarly consensus is that "the Iliad and the Odyssey date from the extreme end of the ninth century BC or from the eighth, the Iliad being anterior to the Odyssey, perhaps by some decades." They are presumed to have existed as an oral tradition that eventually became set in historical records. Even at that early time the Gorgon is displayed as a vestige of ancient powers that preceded the historical transition to the beliefs of the Classical Greeks, displayed on the chest of Athene and Zeus. According to Ovid (Metamorphoses), a Roman poet writing in 8 AD who was noted for accuracy regarding the Greek myths, Medusa alone had serpents in her hair, and that this was due to Athena (Roman Minerva) cursing her. Medusa had copulated with Poseidon (Roman Neptune) in a temple of Athena after he was aroused by the golden color of Medusa's hair. Athena therefore changed the enticing golden locks into serpents.